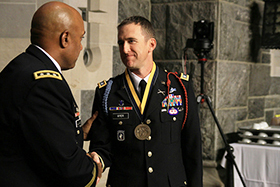 “Lieutenant Colonel Myer is an incredible leader who is the epitome of the Army’s warrior ethos, and who truly embodies the West Point values of Duty, Honor, Country,” said Lieutenant General Darryl Williams ’83, Superintendent, in his opening remarks at the Nininger Ceremony. Myer brought up an amazing example of his own during his speech, 1LT Matt Ferrara ’05, who was killed in action on November 9, 2007 during an ambush in Afghanistan, but not before he was able to direct air support against the enemy, preserving the life of every soldier in his platoon. “Had he survived, he would be the recipient of the Nininger Award,” said Myer in his speech. Ferrara’s parents, Mario and Linda Ferrara, and his brother, Captain Andy Ferrara ’10, were present at the Nininger Award ceremony, and the Corps gave them a rousing round of applause when Myer acknowledged 1LT Ferrara’s noble act during his remarks. Myer is currently the commander of the 1st Battalion-501st Infantry (Airborne) Regiment, 4th Brigade Combat Team (Airborne), 25th Infantry Division stationed at Joint Base Elmendorf-Richardson in Anchorage, Alaska, the only airborne brigade combat team in the Pacific Theater.